The Cricket Trailer is sort of like the Safari Alto Trailer I showed you a while back. This lightweight camper is the answer to rising fuel costs since with a weight of 1,300 lbs you can tow it with most cars. It’s funky looking yet shaped to where it’s somewhat aerodynamic. Garrett Finney is the man behind the company. He was a NASA engineer and wanted to take his expertise to design extremely tiny spaces like The Cricket. It’s the solution between a tent and an RV. I like to think of it as a mash up of a pop up travel trailer and a teardrop camper with NASA engineering. The Cricket has an extra wide door so you can get in and out easy. There are plenty of windows throughout to keep the breeze coming in. And don’t worry, they’re meshed to protect you from mosquitos. The roof takes 20 seconds to pop up which gives you 6’2″ of height inside. The rear door can be lifted and then used as an awning for shade. Good thinking! Pricing starts at $14,000 in the United States. For more posts like this join our Free Tiny House Newsletter! If you enjoyed the Cricket Trailer “Like” and share it using the buttons below then tell us what you like most about it in the comments. Thanks! Alex, this guy needs to bring his Cricket Trailer toys to the tiny house community. I want those mesh/shade windows badly! That is beyond wonderful. The other sleeping/storage combinations were excellent. I hope for his sake and his business that his videos improve. The 2nd video was too short and fast. The 1st video had bad acoustics in the factory area. Open captioning might help but I couldn’t get my closed captions option to work well enough to keep up. I hope you post updates from Cricket Trailer as I see many things that can be brought over to a tiny house. I designed one similar only instead of a cloth pop up I had a slide up with a smaller hood roof wall that gave you 7 feet of head room when extended up. I don’t care much for the shape of the sidewalls and the interior could be better designed with built-ins but it has good potential! While it may be light it’s ugly and certainly not aero. The front has hard corners which alone destroy any chance of being aero. Only the lower frontal area helps but that costs interior room. I’m thinking of building FG aero shells for trailers, campers that actually cut the towing vehicle drag so much towing it doesn’t use any more power next yr, All aero is is good shapes which need not cost more than bad shapes. If the guy is trying to sell these, what was he thinking when he made that crazy vid? My eyes can not even focus on his work! This new trend is soooooooooo annoying! I think this is a great little camper! 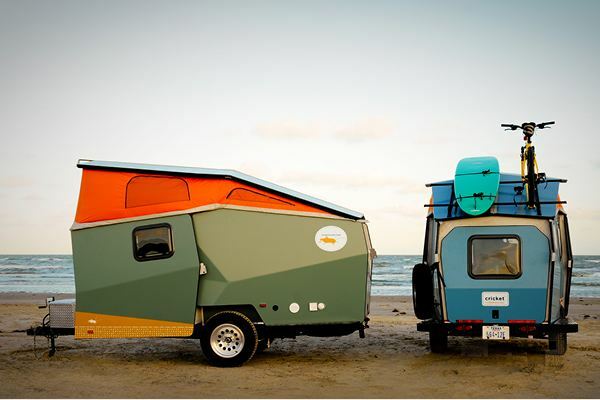 Love that it’s light and a cross between an RV and a pop-up. I agree with the others, though, about the videos. Hard to understand him with the sound quality on the first one, and I HATE the flipbook movie. Way too fast and the choppiness was really irritating. If this is a new trend, it can go back where it came from. Love that it’s sporty and unique. Sometime these comments are like a train wreck that you just can’t look away from. I agree with you. It’s a cute CAMPING trailer. It looks well designed and thought out. People–this obviously was not designed for full time living, so negative comments about its use for that are pointless. As for the INEVITABLE comments to almost every post here comparing something made by a small company or an individual to “a 28′ camper for that price right off the showroom floor”, get a grip. You know nothing about the economies of scale in production, and if you can’t tell the difference between the cheapest white box trailer and something like this, well just go buy your white box and be happy for the two years it lasts. I can buy a diamond ring at Walmart, so that makes anything more than $15.00 a rip off??? Sorry, but I get cranky about the endless nitpicking in the comments. Sorry, but I disagree with you on the cute factor. I think it is ugly. Think Superman’s Bizarro world (No… they haven’t made the movie yet)! Claims that it is 6′ 2″ in height. Deceptive statement as it is only that height for less than half the length. $15 for a diamond ring? Yeah right! I get cranky at people making obviously dumb statements. Or was that a typo on your part. Sorry Ellen, I see your comments as no better than the so called others nit picking comments. Opinions are valuable. You might not agree with them but they are different perspectives. What you like, or I like, or even what Alex likes, heck they are all different. Some of those nit picking comments make me look at things in different ways. The result, I see things I hadn’t seen before, even though it was right in front of my eyes. And sometimes what I see are things that are better, and more often than not the exact opposite. I won’t want to live in this thing but for outdoor camping it looks so much easier to haul around then some other campers out there. But could you pull that 28’er with a 4 banger like the Cricket can be? The Cricket reminds of a modern take on the VW Vanagon. Definitely aimed at those who enjoy backpacking and tent camping in remote areas and not the bringing home with us to the full hook up RV pad community. Pretty sure you cannot back pack this even as light as it might be! Suspect what you MEAN is to TOW to the “backwoods” and THEN set it up and camp—in a park or on some ones land. Maybe use as a “base camp”. Still need a sanitation system—even if that is a 5 gallon bucket toilet. OR a hole in the ground! Not a bad idea and it is cute–but yes the “Economy of scale” sadly means it WILL cost a LOT. Some of the bumper pull tow RV campers are much the same price and altho they might not last forever they WILL last quite a while with care and you can take more people with you should you want. My thought is to buy an actual trailer made for hauling hefty things and then go to IKEA and stockpile Habitat finds etc to outfit for MUCH less than a store bought one. That way I would get my toy hauler AND set the bathroom etc the way I NEED for it to be set up—next to the BEDROOM—not the way some “engineer” at the factory decides some 25 year old is going to use it. This handicapped 50-some has different needs–that just are NOT being addressed by RV makers. I could go on with this–a challenge to those who want to take on these design flaws. Ellen, this is a late reply, but thank you for airing one of my biggest concerns with open forum responses. In this case anyone who tries to compare a sub-compact Honda Fit with a monster Chevy Suburban and expects to sound informed and thoughtful is wasting my time, and the same applies to this charming I-can-enjoy-this-cool-camper-AND-afford it!! If I had one of these all decked out…and hooked up to my Jeep Wrangler…I would not even need a house..!! LoL..!! I would explore the Utah, & Arizona country for months..!! Awesome..!! Many clever ideas. Potty against dishtowel is not one of them. I laughed out loud at the shower/ potty “room”. The audio on the 1st video is so bad I stopped it, and the 2nd one is too jerky to watch. Therefore, I know nothing about the trailer at all. It’s a shame, as we are planning to buy a camping trailer in late spring. Even when we build our THOW, we don’t want to take it on the road, so we plan to tour with a camping trailer to find the plot of land we want for the THOW to rest upon, and we will still use to the camping trailer for that reason alone. Why are there no shots of it floded down or being set up? Next post: Do Tiny Houses Have to be so Expensive?